Most journalists might receive an award for reporting a story about how a disease epidemic is affecting the community. In Cuba, however, that kind of journalism only gets you prosecuted. Apparently, that's the message the Castro regime hopes to deliver to Guillermo Espinosa Rodríguez of Santiago de Cuba, who on Monday was sentenced to two years of house arrest for the supposed crime of being a "social danger," according to a story by Virgilio Dela posted at CubaNet. The CubaNet story states that authorities had repeatedly harassed Espinosa because of his stories about how an outbreak of dengue fever was affecting residents of the Santiago. 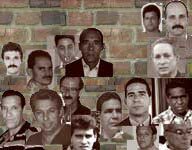 Other Cuban journalists who have written about the epidemic have been subject to the same treatment, but Espinosa is the only one known to have been tried and sentenced because of his work. Espinosa was tried 12 days after he was first detained by State Security. Under the terms of his sentence, Espinosa, a former nurse, will not be able to work as a journalist, without the risk of being sent to prison. Reporters Without Borders has more.